Wheels: 18 Painted Aluminum, Valet Function, Unique Cloth Bucket Seats -inc: 10-way power driver's seat w/power lumbar and recline, 6-way power passenger seat w/manual recline and 4-way adjustable driver and front-passenger head restraints (2-way up/down when dual-headrest DVD entertainment system (50S) is ordered), Trip Computer, Transmission: 6-Speed SelectShift Automatic, Towing Equipment -inc: Trailer Sway Control, Tires: P245/60R18 AS BSW, Tire Specific Low Tire Pressure Warning, Tailgate/Rear Door Lock Included w/Power Door Locks, Systems Monitor. This Ford Explorer has a dependable Regular Unleaded V-6 3.5 L/213 engine powering this Automatic transmission. 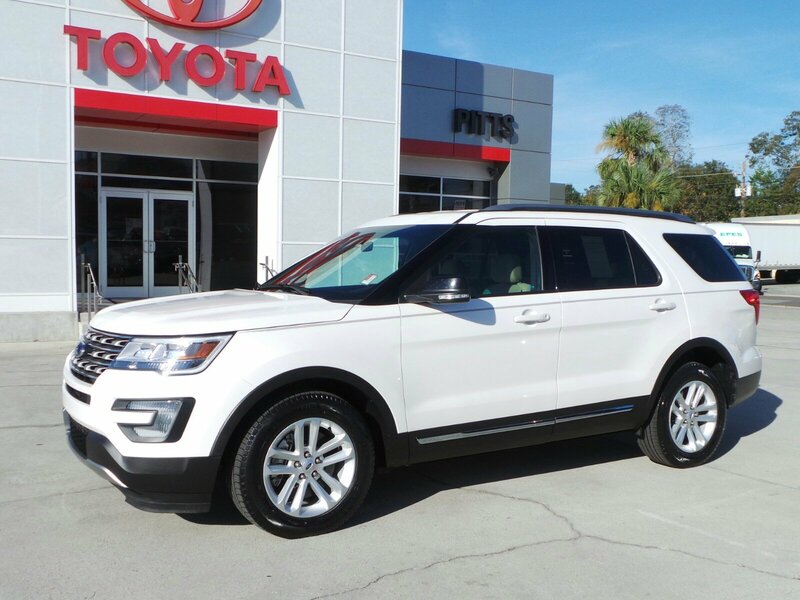 *This Ford Explorer XLT Has Everything You Want *SYNC Communication & Entertainment System -inc: enhanced voice recognition, 911 Assist, 4.2 LCD screen in center stack, AppLink and 1 smart-charging multimedia USB port in the Media Hub, Note: SYNC AppLink lets you control some of your favorite compatible mobile apps w/your voice, It is compatible w/select smartphone platforms, Commands may vary by phone and AppLink software, Strut Front Suspension w/Coil Springs, Streaming Audio, Steel Spare Wheel, Speed Sensitive Variable Intermittent Wipers, Side Impact Beams, Securilock Anti-Theft Ignition (pats) Engine Immobilizer, Seats w/Premium Cloth Back Material, Safety Canopy System Curtain 1st, 2nd And 3rd Row Airbags, Roof Rack Rails Only, Remote Keyless Entry w/Integrated Key Transmitter, Illuminated Entry, Illuminated Ignition Switch and Panic Button, Rear Parking Sensors, Rear HVAC w/Separate Controls, Rear Cupholder, Rear Child Safety Locks, Radio w/Seek-Scan, Clock, Speed Compensated Volume Control and Steering Wheel Controls, Quasi-Dual Stainless Steel Exhaust w/Chrome Tailpipe Finisher, Proximity Key For Doors And Push Button Start, Power Rear Windows and Fixed 3rd Row Windows, Power Door Locks w/Autolock Feature. *Driving Away with This Ford Explorer XLT Doesn't Mean Compromising On Quality *According to Carfax's history report: Carfax One-Owner Vehicle, No Damage Reported, No Accidents Reported. *Critics Agree*KBB.com 10 Most Awarded Brands, KBB.com Brand Image Awards. *Stop By Today *A short visit to Pitts Toyota located at 210 N Jefferson St, Dublin, GA 31021 can get you a reliable Explorer today!